Shumlin: IBM-Vermont in "Expansion Mode"
For months, Gov. Peter Shumlin has assiduously avoided speculating publicly about the future of IBM's Essex Junction plant. But two weeks after he met with the company's top brass in his Montpelier office, the governor is now speaking out about the plant's prospects, which he believes are far brighter than the financial press have indicated. 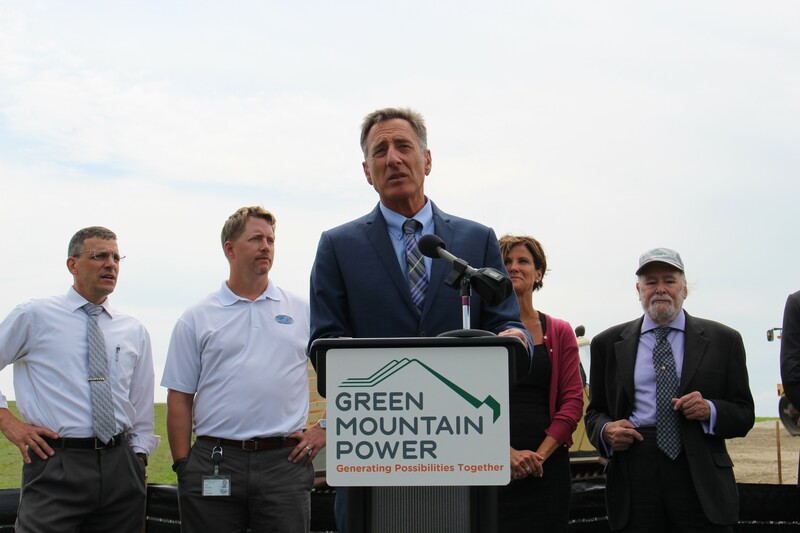 In an interview with WCAX-TV on Wednesday and with Seven Days on Thursday, Shumlin said he left the July 29 confab with a new understanding of the facility's strengths, innovation and competitiveness. "I came out of this meeting feeling really optimistic about the plant, about the work they're doing right now and the over 4,000 hardworking Vermonters that are doing it," he told Seven Days. "We often hear about, you know, the downs, when they're laying people off. They informed me they were hiring, right now, dozens and dozens of people." Shumlin conceded that the company's new hiring in Vermont does not make up for two rounds of layoffs last year that left hundreds unemployed — not to mention the thousands more who have lost their jobs at the plant over more than a decade. But he argued that in the "highly volatile" microelectronics business, "we read about the downsizings and we don't usually read about the upsizings — but that's exactly what they're going through at this moment." "They've moved from contraction mode to hiring mode — to expansion mode," he said. "This is the nature of this business. There will be more contraction modes; there will be more expansion modes. All I'm saying is we tend to read about the contraction, not the expansion. They're in an expansion mode right now. That was very clear to me." Since he took office in 2011, Shumlin has met with IBM executives roughly once a quarter — typically three times a year in Vermont and once at the company's Armonk, N.Y. headquarters. July's meeting included John Kelly, IBM's senior vice president and director of research, and Michael Cadigan, vice president and general manager of the company's microelectronics, systems and technology group. Joining Shumlin were chief of staff Liz Miller, Secretary of Administration Jeb Spaulding and Secretary of Commerce Pat Moulton. Shumlin's July meeting came a week before Bloomberg reported, citing anonymous sources, that IBM had attempted to pay rival GlobalFoundries $1 billion to take its chip-manufacturing unit off its hands. The governor said he would not comment on that story, nor speculate about the company's negotiations with GlobalFoundries, but he cast doubt on the reporting he's seen on the subject. "I do believe that some of those things that we have read in the press — not all of it, but some of the things that I've read in the press — are in stark contrast to what I heard in this meeting, which is it's a technology that has a huge demand," he said. In recent months, Shumlin said, IBM has increased the speed of microchips produced in Essex Junction by 35 percent, and the company has invested "millions and millions of dollars" in the facility. "You can't buy a smartphone in the world right now without, in almost all likelihood, it having many chips all made here at the Essex Junction plant," he said. "The technology that they're using for those chips is not available to their competitors — not just in America, but all over the world. You know, the Chinese don't have these skills at this point. The Indians don't have these skills at this point." Though Bloomberg reported last month that talks between IBM and GlobalFoundries had broken down, analysts have speculated that negotiations are ongoing — or could be revived. And it's unclear whether IBM's — and Shumlin's — optimism about the Essex Junction plant's future is part of that delicate dance. Just last week, in a move that appeared designed to goad Big Blue, GlobalFoundries held job fairs in Burlington and in other communities that play host to IBM facilities. It's also unclear whether the facility and its employees would be better off under the ownership of IBM, which has been moving away from manufacturing, or GlobalFoundries, whose business model centers around chip production. "That's a really good question," Shumlin said, declining to answer it. "What I learned from that meeting was that regardless of ownership, which I'm not going to speculate on, when you look at the chips that IBM is currently manufacturing... these chips are needed, are in demand. We've got an extraordinary workforce making them. They're looking for more people to help make them, and those chips have a future." Neither IBM nor GlobalFoundries will comment on their discussions with one another, but IBM spokesman Jim Keller said Thursday that he "can support the statements" Shumlin made during his interview on WCAX. "I think you can certainly say that IBM appreciated the opportunity to meet with the governor in late July and we felt that both parties came away with a positive feeling," Keller said. Though Keller would not reveal specific numbers, he confirmed that IBM "continue[s] to invest in the Essex plant and all of our microelectronics business." As for its hiring in Vermont, he said, "I won't get into an exact number, but [Shumlin's] characterization of 'dozens and dozens' is accurate." "We are operating at or near capacity and demand, especially in the mobile-smartphone markets [which] is increasing," he said. So did IBM make any commitment to Shumlin that it — or at least its Essex Junction facility — was in Vermont for the long haul? "The answer to that is I didn't ask them to," the governor said. We didn't have that conversation, because obviously we can't talk about negotiations that might or might not be going on — and I didn't want to put them in the position of having to answer a question like that."